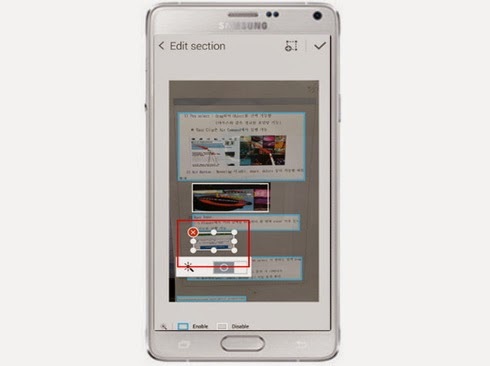 Home » Tutorials » Samsung Galaxy Note 4: What is Photo Note and how to use it? Tap the S Note for Photo Note. Tap the Create new note icon. Tap the Photo note icon. Focus on images to take. For best results, take picture when border around subject is blue. The camera will detect a rectangle shaped edge. You can change the detection mode between Auto and Manual. Use Auto mode to capture document easily. For more precise editing, tap to switch to Manual mode. Tap the camera button once the edges have been correctly detected. After shooting, you can manually adjust the detected edge area and rotate image direction. If editing is completed, tap the Save button. After cropping or stretching you image, Photo note will automatically recognize text and images by different sections in your document. When touched the each section, you can choose to apply or remove the Photo note effect. The Photo note effect will make the background color white, making it easier to recognize text. If you choose not to apply the Photo note effect, your section will be copied and pasted as it is. You can remove or add sections to your documents. To remove sections, tap the Close button. To add new sections, tap Plus button. New section is added and you can change the section location to apply Photo note effect. Each section will be pasted into S Note as a separate image. If section edition is completed, tap the Save button. When taken image is inserted in S Note, background color and sections with Photo note effect are changed to white. It can improve the readability of text. On S note, you can edit, cut, crop each sections by tap and hold the section. If you tap and apply Convert to edit to image section on S Note, the image section is changed to white color. If section edition is completed, tap the Save button. Question: When using the Gallery images to edit in Photo Note of S Note, it takes a long time to move or copy after adding strokes to inserted image and editing. What’s the problem? Since each stroke is controlled individually by S Note's internal logic to provide various editable functions, performance degradation might be occur if there are too many strokes on edited images. S Note can provide a best performance in 2,000 strokes. For the best drawing experience, use SketchBook pro or ArtRage which are provided in Galaxy Gift.